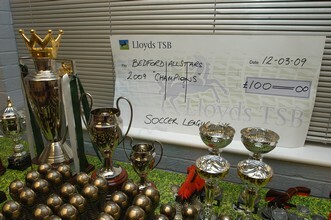 Each year Soccer League UK really dig in deep and get the local community well involved to help the less fortunate. 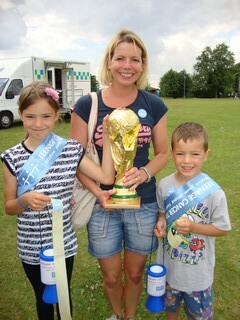 Many people don't have the time or effort to put back into the community, Soccer League UK provide a aiding hand. Here are some of our charity work we have done through our work, with your help we can continue to do so. To Mohammed Kabir and the guys at Soccer League UK, the referees, the ball boys and the guys that helped out on the day and most importantly, to all the teams and the individuals who made the effort to come along, participate and therefore contributed toward my fundraising drive in aid of the Teenage Cancer Trust. I would like to offer each and every one of you my deepest and most heartfelt gratitude for the success that was the Bedford Mini World Cup. The money that you have helped to raise is going to an exceptional cause, the TCT (Teenage Cancer Trust). There it will be used to fund the building of units in hospitals just for young people being treated for cancer. In these units they can socialise with other young people and support each other while they are being looked after by specialized doctors and nurses. I really can't thank Mohammed Kabir, Abdul Kahhar and Russell (they are the people behind the scenes at Soccer League UK) enough for the hard work they put into making sure this tournament was a success. After spending a few hours over the course of six weeks in the office with them it became clear how much time and effort goes into making sure a thirty two team machine such as the Mini World Cup remains well oiled. It's hard enough collecting enough guarantee's in the form of deposits to even get it fired up. Again, thank you so much. I would like to say well done to the referees as-well. You had a hard task on Sunday. I know I would not enjoy being told repeatedly how insufficient my knowledge of the game is by the offending team and their supporters after every foul only to be thanked sarcastically when the tables were turned. I've always wondered what the appeal in refereeing is. We should all remember though that without the ref's Sunday, and every other football match for that matter, would have just turned into a festival of brawling. So again referees, thank you. To the lads that were roped into to help out with the ball-boying, clearing up and generally just being helpful. You didn't have to come down on a Sunday, giving up your spare time just to make sure that a tournament that you're not even playing in went as smoothly as possible. You didn't even have to stay after it ended just to pick up the rubbish that the diva footballers couldn't be bothered to put in a bin but you did. So once more, Thank you for doing all that you did, we wouldn't be able to host tournaments if they were chaotic affairs and we just left the places we were lent in a mess. But Just by turning up you made a tournament happen, it doesn't matter that you enjoyed it. You helped to raise money for a really, really GOOD cause and for that, I honestly am truly grateful. I turned up quite late and to see the sheer amount of people who had turned up gave me such a buzz. So one last time, THANK YOU SO MUCH! Soccer League UK hosted a Children In Need Charity Challenge 11-A-Side football match with two of Bedford's Sainsbury's Supermarket's store employees. Both teams kicked off and there were only a few chances in the first half with Aaron and Alex netting the only goals in of the half for Clapham 2-0. The second half gets under way and Kuller gets Clapham's 3rd and Russell with the 4th. Kempston then get 2 goals in the space of 10 minutes but there was no way back when Russell got his second and John finished the scoring 6-2 for Clapham Sainsbury's. As many of you have seen tens of thousands of people were killed when magnitude 7.0 earthquakes hit the capital Port-au-Prince, Haiti - the worst in Haiti in 200 years tarnishing many lives. 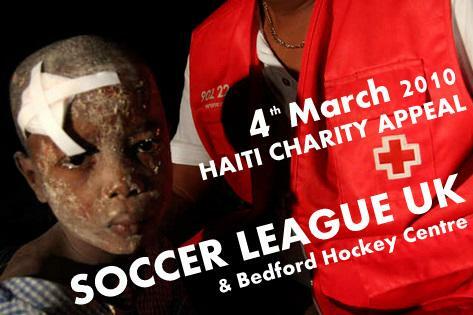 As a duty upon humanity, Soccer League UK in collaboration with Bedford Sports & Hockey Centre arranged for a ‘Haiti Charity Appeal' on Thursday 4th March 2010. All matches played on the night were friendly games with all the match fees donated to the British Red Cross, extra donations were encouraged. And what a night it has been at Soccer League UK. A ‘BIG' thank you to all the teams that participated in the ‘Haiti Charity Appeal' and helping to raise a massive amount of over £600 for the Haiti disaster. As promised, all match fees along with extra generous donations that have been made by the teams and spectators were donated straight to the British Red Cross. Also, Bedford Sports & Hockey Centre have waived their pitch fees for this special occasion. Members of the British Red Cross were on site to show their appreciation and make bucket collection to ensure that maximum donations could be raised for the less-fortunate and for those that are not directly involved with the teams don't lose out the opportunity too. 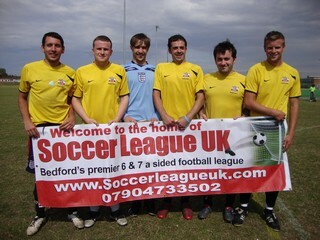 The matches were followed by the Soccer League UK's annual awards for last season's champions and runner up. There were a number of individual awards for outstanding performances. The Haiti Appeal and the awards ceremony was supported by Councillor Roger Rigby, Bedford Borough Council's Speaker, The Mayor of Kempston, Steve Collins, Councillor Brian Dillingham, Mike Riley - Chairman of Sports for Bedford and John Moore - Partner with Sharman Law Solicitors, all of whom took part in presenting the teams and individual awards on the night. The appeal evening was organised by Soccer League UK who was delighted that so many people donated their time and effort to make the evening such a success. A big thank you too all the teams and spectators for helping those that are less fortunate in Haiti.